Get this Farberware 3-Liter Digital Oil-less Fryer, 8 Pre-Programed Cooking Options on sale for just $39 (Retail $69.99)! 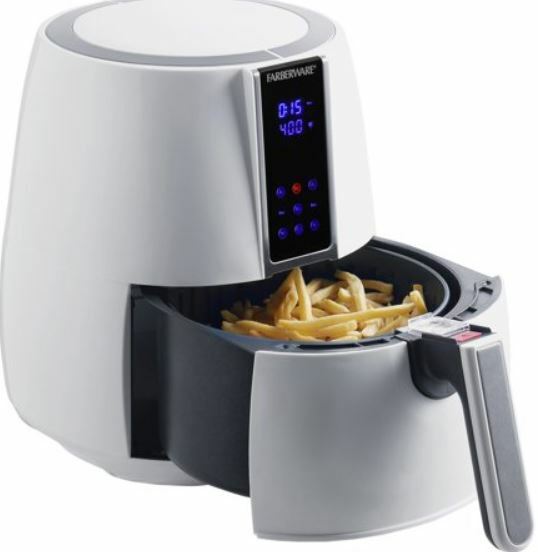 Enjoy tasty, crispy, fried treats from the comfort and convenience of your own home using the Farberware Digital Oil-less Fryer. This advanced fryer is the perfect appliance to grill, bake, roast or fry family favorites like chicken, fish, onion rings, potatoes and even desserts! Unlike the fryers in fast food restaurants, the Farberware unit uses little to no oil, so youll enjoy healthier recipes that will serve both your taste buds and your waistline well. Load up the dishwasher-safe basket with up to 2 pounds of your favorite food, select the proper time and temperature from the touch screen, and let the fryer go to work circulating hot air evenly throughout. The result? Youll get crispy, fried perfection without the guilt! And, with less oil to contend with, clean-up will be a breeze. No more soaking and scrubbing the fryer basket for hours on end. Just pop into the dishwasher and go!